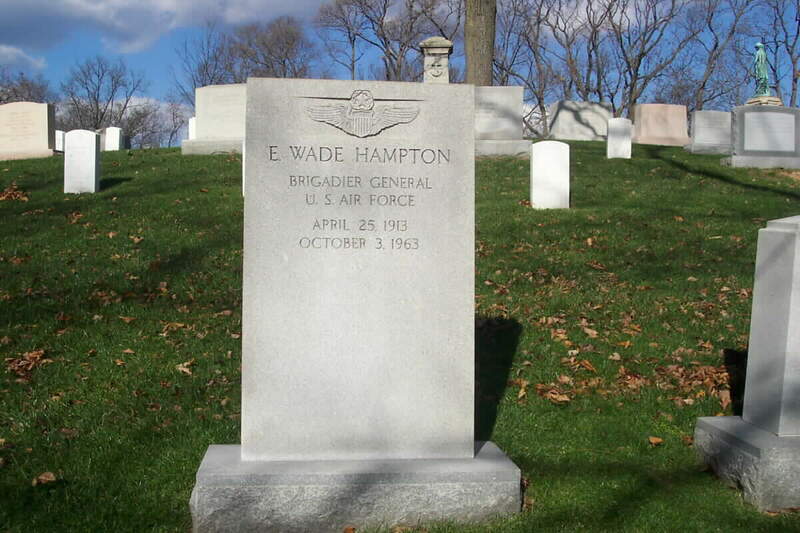 Brigadier General E. Wade Hampton was born in Atlantic City, New Jersey. In June, 1937, he enlisted at Camden, N.J. He graduated from Advanced Flying School, Kelly Field, Texas, and was commissioned a Second Lieutenant in the Air Corps. He was a member of the Third Attack Group at Barksdale, Louisiana, and Savannah, Georgia, through 1941. He went with the 27th Attack Group to the Philippine Islands and later served as commander of the 374th Troop Carrier Group in the Southwest Pacific Theater. After duty with the Headquarters of the 1st Allied Airborne Army in Europe in 1944, he joined the 61st Troop Carrier Group in France and moved the Group to Trinidad where the 61st Group was deactivated in 1945. General Hampton was next assigned to Headquarters, Air Transport Command, Washington, D.C. He attended the Air University at Maxwell, Ala.; then was assigned as commander, 316th Troop Carrier Group at Donaldson Air Force Base, Greenville, South Carolina, in June of 1947 and moved with the 316th Troop Carrier Group in November 1949 to Sewart Air Force Base, Tennessee. He departed for Japan in August 1950 and joined the 314th Combat Cargo Wing. In December of the same year he became deputy commander of the 315th Air Division. He returned to the Zone of Interior in April 1951 and became the director of operations and training at Tactical Air Command. He completed the Army War College in September 1952. In June 1952, General Hampton was assigned to the Office of the Director of Plans, Headquarters U.S. Air Force. He served as a member of the Secretary of the Air Force Personnel Council in 1953. He joined the Eighteenth Air Force in 1954 as deputy chief of staff for operations. In February 1955, he became commander of Donaldson Air Force Base and the 63d Troop Carrier Wing. In September 1958, he reported to the Western-Transport Air Force (Military Air Transport Service) located at Travis Air Force Base, California. General Hampton was assigned to Headquarters U.S. Air Force as director of transportation, Office, Deputy Chief of Staff, Systems and Logistics, July 1961. A command pilot, his decorations include the Silver Star with oak leaf cluster, Legion of Merit with two oak leaf clusters, Distinguished Flying Cross with oak leaf cluster, the Purple Heart and the Order of the British Empire. General Hampton's promotion to brigadier general (temporary) was effective August 5, 1957.